VPN Gate is an online service that originally was created in Japan which aims to, in their words, expand the knowledge of “Global Distributed Public VPN Relay Servers”. I like using their services, as it’s a great way to test how visitors at specific locations around the world can access your website. What they can see, how the links operate, checking if Web Application Firewalls on my website are being blocked if I blocked a specific country, that sort of stuff. Very useful in my industry (working in IT). 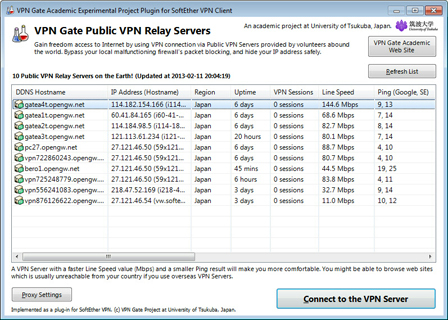 VPN Gate Client is currently freeware and primarily available for Windows. You can download the software program directly from their website or from CNET’s Download.com website. Which version of VPN Gate do I install and download? You do not need to install SoftEther VPN Server to use it. If you are using MAC OS X or Android or iPhone, please check their online guide for how to install it on those devices, as you’ll be looking to rely on the device’s specific native VPN (Virtual Private Network) functions to get this working. How do I use VPN Gate? Once you install it, you’ll be able to select the countries to VPN from. It’ll look something like the following, however, it’ll also have more Regions to choose from. So you select the Hostname (DDNS Hostname) you want to connect to and follow the prompts. The speed will always vary depending on the server and currently load on the server.